With the recent passing of Gabriel García Márquez (1927-2014) I decided it would be good to pay my respects by finally reading one of his books. Being in between story collections, Strange Pilgrims felt like the obvious choice and I knew it for such when García Márquez greeted me in the introduction by recounting a dream where he attended his own funeral: walking with a group of friends dressed in solemn mourning but in a festive mood. We all seemed happy to be together. And I more than anyone else, because of the wonderful opportunity that death afforded me to be with my friends from Latin America, my oldest and dearest friends, the ones I had not seen for so long. At the end of the service, when they began to disperse, I attempted to leave too, but one of them made me see with decisive finality that as far as I was concerned, the party was over. “You’re the only one who can’t go,” he said. 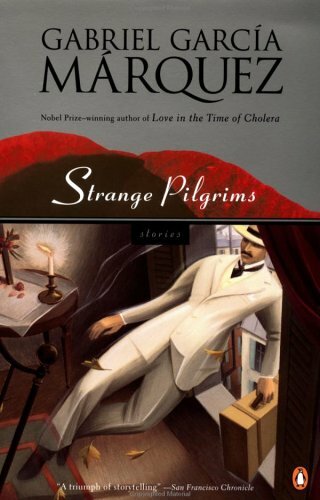 Strange Pilgrims is a themed set of stories that García Márquez published in 1992 but had been struggling with since the 70s, a mutable and often hopeless project he could never bring himself to abandon. Upon publication, it was swiftly and brilliantly translated by Edith Grossman (1993). My Penguin edition has a lovely wraparound cover by Cathleen Toelke, which was another factor in my choosing this book over any of his classic novels. The stories are centered around Latin Americans in Europe – old and dying, young and struggling, all displaced in a landscape both surreal and devastating. The stories cover realism, magical realism and nightmare. There is in fact a strong element of the macabre at work here and almost all of them deal in some way with (often violent) death. Yet here is the truly astonishing thing: even with its themes and motifs so strongly on display, there is no repetition to be found. This is doubtless due to the long gestation period: Because I worked on all the stories at the same time and felt free to jump back and forth from one to another, I gained a panoramic view that … helped me track down careless redundancies and fatal contradictions. There is a great deal of strength and weight to each of the tales. I had come across his stories in compilations before but they’d one and all left me cold. Not so with Strange Pilgrims. It takes nostalgia, menace, beauty, Europe’s antiquity and incompetence – often using an author stand-in who has seemingly “collected” the stories as journalism – and never failed to draw a reaction from me. The majority of the collection only lightly touches on magical realism. A dog is trained to weep over a grave, a woman makes a living selling her dreams, but García Márquez tackles the inexplicable in all forms. ‘The Ghosts of August’ is a straightforward ghost story (and perhaps the least affective of the set due to its brevity) while others lean toward Kafkaesque situations. ‘Seventeen Poisoned Englishmen’ revisits Rome, this time with a bereaved and pious widow on a pilgrimage to see the Pope while struggling to endure so crowded and venal a city. At that early hour her only fellow diners were the waiters and waitresses and a very poor priest eating bread and onions at a back table. When she went in she felt everyone’s eyes on her brown habit, but this did not affect her, for she knew that ridicule was part of her penance. The waitress, on the other hand, roused a spark of pity in her, because she was blonde and beautiful and spoke as if she were singing, and Señora Prudencia Linero thought that things must be very bad in Italy after the war if a girl like her had to wait on tables in a restaurant. Tallied up, only one of the twelve breaks the pattern. ‘Sleeping Beauty and the Airplane’ centers on an unbearably pretentious old man gazing in adoration at his airplane partner. Unluckily for him, the most beautiful woman he’s seen in his life takes sleeping pills the moment she boards and remains a mystery. He quotes sonnets and reflects on Kawabata’s House of the Sleeping Beauties while longing for her to wake – even welcoming turbulence, such is his vain desire. Kawabata’s concept apparently so fascinated García Márquez that he expanded on it with his final work, the novella Memories of My Melancholy Whores (2004). Everything works as a distinct entity. There’s no filler – every story is imaginative and unpredictable. However, my favorites are easily the most sinister. Along with Carlos Fuentes and Felisberto Hernández, García Márquez is further proof that Latin America contains a rich seam of horror fiction that for some reason is not often remarked upon. “I Only Came to Use the Phone” is simply one of the scariest stories I’ve ever read. A woman’s car breaks down in the desert and she hitches a ride on a bus. But the bus’ destination is a women’s insane asylum where she’s mistaken for a patient. Asylum clichés are loaded on with a trowel but there is a terrifying plausibility as circumstances collude to keep her imprisoned. ‘Tramontana’ deals with a more inhuman menace, a harsh, tenacious land wind that carries in it the seeds of madness… Susceptibility increases with exposure so that the old pros have the most to fear. However, it is ‘The Trail of Your Blood in the Snow’ that best captures the pure disorientation of these pilgrims to the Old World. On their honeymoon in France, Billy Sánchez’s wife pricks her finger on a rose and begins, inexorably, to bleed to death. He rushes her to a Parisian hospital but then finds himself lost, unable to speak the language or regain admittance, doomed and isolated by bureaucracy and his own characters flaws. Strange Pilgrims is a powerful concoction. Colourful imagery both enhances the terror and regret of displacement and conveys the beauty and mystery that lead a person to endure such homesickness. 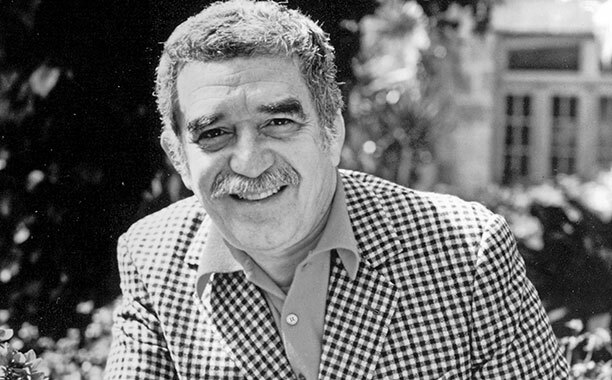 García Márquez appears not only to have been satisfied with Strange Pilgrims but to have made it the conclusion of his work with the form – in the twelve years to Memories of My Melancholy Whores he published journalism, a memoir and the novel Of Love and Other Demons but no more story collections, making this his crowning achievement in the field. It is exceptional. Simply put, it belongs in your Latin American literary collection. If you don’t have a copy, I demand that you get one.